The award-winning John and Nellie Wooden Institute for Men of Principle is an incredible opportunity for initiated Betas that focuses on the ritual of Beta Theta Pi and becoming a better leader. The Wooden Institute allows Betas to interact with brothers and Friends of Beta from across North America. Participants share ideas, dissect Fraternity ritual, partake in challenging activities that focus on leadership skills, learn more about the history of Beta Theta Pi and reflect on the Fraternity’s heritage. Most importantly, participants have fun with other initiated Betas in Oxford, Ohio! Participants will be accepted on a first-come, first-served basis, and you must be an initiated member to attend. Participation is open to 25 members per chapter with a maximum of five members per chapter/colony per session. Because quarter schools cannot attend all sessions, they may register additional students but must contact Beta’s Leadership & Education Department (800.800.BETA) to do so. 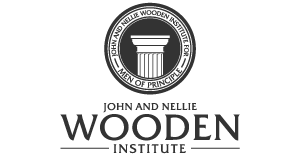 The Wooden Institute was endowed and named by Carol and James A. Collins, UCLA '50, in honor of legendary coach John R. Wooden, Purdue '32, and his beloved wife Nellie. This program received the Most Outstanding Use of a Foundation Grant Award from the North-American Interfraternity Conference in 1999. Winter Session - Registration opens October 1 and closes December 15. Summer Sessions - Registration opens February 15 and closes April 15. For general questions, please contact Cody Hike at the Administrative Office.